Hurricanes are ferocious storms that result from exactly the right weather and ocean conditions. Meteorologists are scientists who study the weather. Oceanographers are scientists who study the ocean. They both work to learn more about these storms so people can be better prepared when they come. Two excellent websites for information on hurricanes are The National Weather Service’s Jet Stream – Online School for Weather at http://www.srh.noaa.gov/jetstream/index.htm and the University of Rhode Island’s Hurricanes: Science and Society at http://www.hurricanescience.org/#/?id=0. If you live in a hurricane vulnerable area, be sure to pay attention to your local weather sources in the event of a storm. But also check the National Hurricane Center’s invaluable website at http://www.nhc.noaa.gov/. This website gives much more detailed information about storms as they develop and about their probable paths. 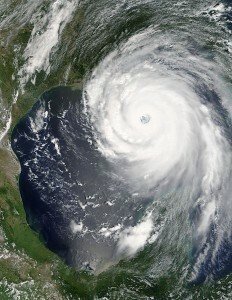 This image is a NASA satellite photograph of Hurricane Katrina taken on August 28, 2005, the day before it struck the Gulf Coast.